MODE 8 is a high-resolution screen MODE, selectable with the *MODE command or the NewModes sideways ROM module, that replicates the functionality of the native RISC OS MODE 8. 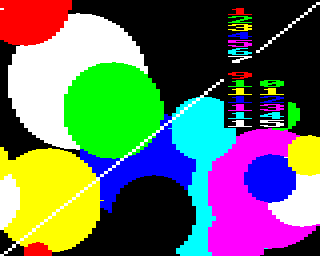 The MODE 8 code adapts the MODE 1 screen to provide a 4-colour version of MODE 0, 80 × 32 characters in 4 colours. It does this by redefining the character set to provide thin characters. MODE 8 can be created manually with the following code running in the I/O processor. MODE 8 is also the unofficial title of an ultra-low resolution screen MODE, a program for which appears on page 383 of The Advanced User Guide for the BBC Microcomputer (Bray et al., 1983) Another program, attributed to Ian Robertson, was published in The Micro User magazine (November 1985, p.123). It works on the BBC and Master but not the Electron, or the Archimedes/RISC OS (where MODE 8 is the official the 4-colour version of MODE 0). The MODE 8 code modifies the MODE 5 screen to provide a 80 × 256 display in 16 colours. The MOS does not allow complete support of this MODE and some bugs can be seen: for instance, graphics drawn off the right-hand edge of the screen wrap around to the left, shifted down one text row; and text windows do not work correctly. This page was last modified on 12 October 2016, at 20:44. This page has been accessed 4,447 times.